Kiwis are perhaps the strangest birds in the world; they are nocturnal, flightless birds endemic to New Zealand that evolved near the base of the avian tree. In many ways they resemble small mammals (see Baker et al. 1995). All kiwis are nocturnal birds (North Island Brown Kiwi, left) that are specially adapted to moving about at night in thick undergrowth. The bill is long and flexible with two nostrils at the tip. The kiwi uses these to detect invertebrates in the leaf litter or even underground, where it will probe for them. 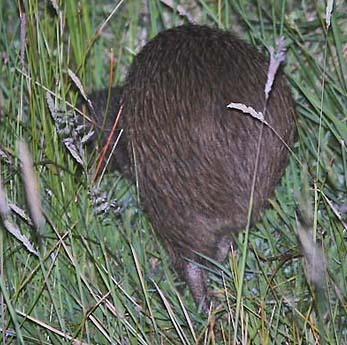 During the day kiwis hole up in burrows; they only emerge after the sun sets. Their senses of smell and hearing are excellent but their vision is poor. During their nocturnal foraging, individual birds can be very focused on their endeavors. This female (right) was so intent on probing the soft, wet soil in the long grass that it allowed us to approach very closely on foot. But another female encountered that same night was very skittish, and ran away whenever we moved. A larger male was also wary, running quickly through the undergrowth. By stationing myself ahead of him, I got off this shot (below) as he swept by. Most kiwis live in pairs, and they communicate through an amazing voice. The pairs duet, and males often 'duel' with males in adjacent territories vocally. Listening to kiwis at night brings one a strong sense of primordial New Zealand. The taxonomy of kiwi populations has changed over the years. Traditionally there were just three species: Brown Kiwi Apteryx australis (on the main islands), Great Spotted A. haastii (restricted to the north tip of South Island and introduced to Little Barrier Island), and Little Spotted A. owenii, an endangered species now limited to a few offshore islets where it has been introduced: Kapiti, Long, Red Mercury, Hen and, most recently, Tiritiri Matangi. More recently, following proposals made long ago by Baker et al. (1995), Brown Kiwi is now often split into three species: North Island Brown Kiwi Apteryx mantelli, Okarito Brown Kiwi A. rowi, and Southern Brown Kiwi A. australis. The latter has two races, one of which inhabits Stewart Island, and birds on the latter island are famous for foraging on a specific beach each night. Many birders have seen their kiwis there. Kiwis seem to be more closely related to emus and cassowaries than any other group of birds in the world. There is some evidence (summarized in Cracraft et al. 2004) that the rate of molecular evolutionary change in these three (emu, cassowary, kiwi) is slower than in other ratites, like ostrich and tinamous. They all followed their own evolutionary paths after the split-up of Gondwanaland so many eons ago. My wife Rita and I very much wanted to see a kiwi during our first visit to New Zealand in 1997. Through just plain dumb luck we ran into "Mr. Kiwi" — Lindsay Charmon — and his stuffed Brown Kiwi with kiwi egg. First, just look at the size of that egg. Think about where it would fit in a kiwi of that size — but it does. It is the largest egg proportionate to the bird's body size in the world. It is four times larger than would be expected for her size. The yolk is 50% larger than any other bird egg and helps during the long incubation period (63-92 days). The male scrapes out a burrow for the nesting chamber and does all the incubation; the female creates and lays 2, and sometimes 3, of these huge eggs. Lindsay Charmon has been hired by the state government on North Island to take his life-mounted kiwi to schools, and teach kids about the kiwi. 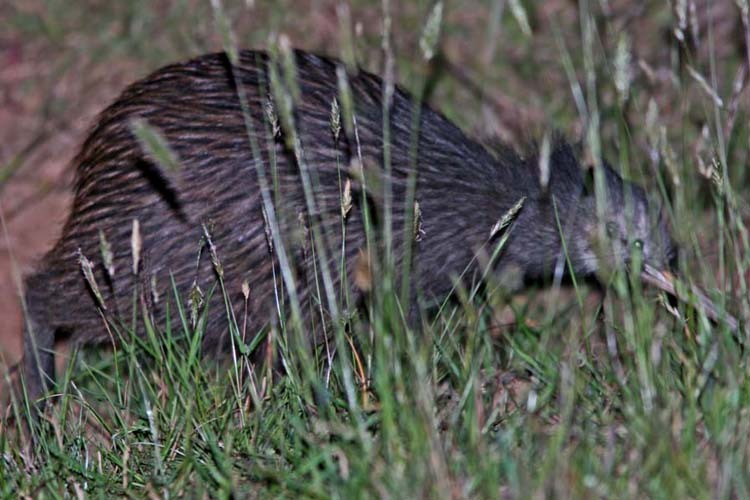 Kiwis are threatened on the mainland, primarily by off-leash and feral dogs, and Lindsay is trying to foster a culture of conservation that will maintain kiwi numbers into the future. We ran into Lindsay quite by accident. Two days after Christmas in 1997, Rita and I were on the boat to Tiritiri Matangi Island, a tiny islet off North Island that is predator free, and on which numerous native birds have been re-introduced. The mainland of New Zealand recalls Hawaii — chopped down forests, nothing but introduced birds everywhere (mynas, European songbirds) — and grazed fields dominating everything (in New Zealand, the grazers are sheep). But Tiritiri Matangi is remarkable: native forests filled with native birdsong. Magical! At lunch we were explaining our 5-day visit and our efforts to see representatives of the four endemic families (New Zealand wrens, stitchbirds, wattlebirds, kiwis). We'd managed the first three but finding a kiwi seemed hopeless. Somehow Lindsay overheard our plight and decided to help. He told us he knew a more-or-less guaranteed spot for Brown Kiwi, but it was all the way at the north end of the North Island, a six hour drive. We said the drive was no big deal but the problem was getting accommodations at the site. But Lindsay used his cell friend to get another friend who got through to the manager of Aroha Island reserve, and we were booked! So here's a shot of Aroha Island Reserve (right). It is that tiny forested islet in the background; the gravel road to it crosses a causeway that is almost flooded at high tide. We settled into our room, had dinner, and waited for dark. Then Rita and I started to explore the islet. We could hear a kiwi on the islet, but heard more on the mainland across the causeway. So we took our flashlights and walked to the spot shown in the foreground here: the verge at the edge of the road in the right foreground. 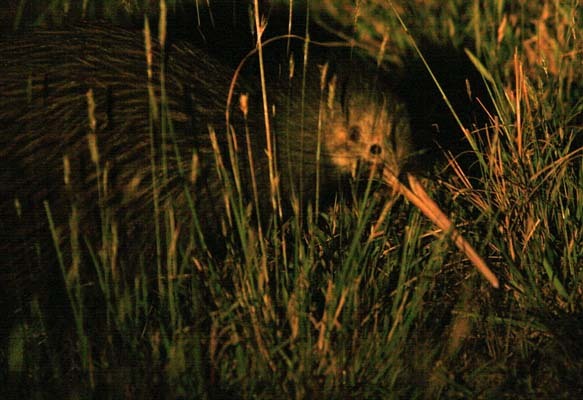 We could hear something shuffling about and wheezing — we pointed the flashlight and there was a kiwi! What a strange beast, er, bird! Another was wheezing on the other side of the road, so we walked up and saw the mate as well. Truly a spectacular finale to a whirlwind New Zealand visit. Photos: All photos of wild North Island Brown Kiwi Apteryx mantelli were taken on the night of 15 Nov 2009, on the Purerua Peninsula, northeast of Kerikeri, near the north end of North Island. 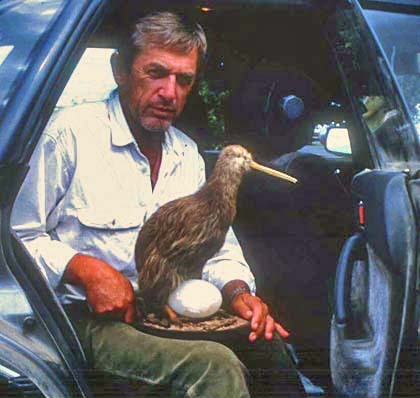 Lindsay Charmon and his mounted kiwi is from the parking lot for the Tiritiri Matangi cruise on 27 Dec 1997. 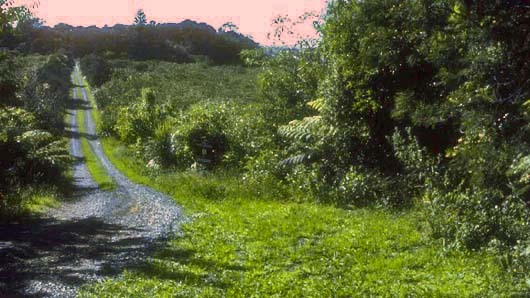 The photo of kiwi habitat at Aroha Island Reserve was taken the next day. All photos © Don Roberson; all rights reserved. Bibliographic note: There is no "family book" per se, but a good introduction to this family, with some fine photos, is in Folch (1992). Baker, A.J., et al. 1995. Flightless Brown Kiwis of New Zealand possess extremely subdivided population structure and cryptic species like small mammals. Proc. Acad. Nat. Sci. Philad. 92: 8254-8258. Cracraft, J., F.K. Barker, M. Braun, J. Harshman, G.J. Dyke, J. Feinstein, S. Stanley, A. Cibois, P. Schikler, P. Beresford, J. Garciacutea-Moreno, M.D. Sorenson, T. Yuri, and D.P. Mindell. 2004. Phylogenetic relationships among modern birds (Neornithes): toward an avian tree of life. Pp. 468-489 in J. Cracraft & M. J. Donoghue, eds. Assembling the Tree of Life. Oxford University Press, New York. Folch, A. 1992. "Kiwis," pp. 104-110 in Handbook of the Birds of the World (del Hoyo, J., A. Elliott, & J. Sargatal, eds). Vol. 1. Lynx Edicions, Barcelona.